Congrats to Sara R. for being randomly selected as the winner of the Seventh Generation giveaway at Northern Cheapskate. 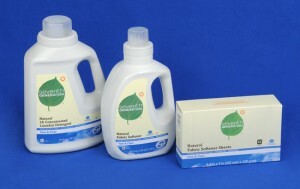 Sara has won a set of three Seventh Generation Laundry products: 2x Concentrated Liquid Laundry Detergent, Natural Liquid Fabric Softener, and Natural Fabric Softener Sheets. So are you the winner? Check your e-mail. I’ve sent Sara an e-mail with details on how to claim the prize.